My specialisation is showing you and your team how to ‘sell’ your product, services, project or ideas effectively… and quickly! Yes, your success relies on people listening to you and taking on-board what you have to say. Isn’t this where every connection starts? Every great communicator is a bit of a ‘people whisperer’. I can help you maximize your effectiveness at this very key, fundamental stage of communication. I call my approach ‘QuickPitch’. It is the method that helps you get your point across quickly and memorably. QuickPitch allows you to open people’s ears and hearts to your message while you have their attention. It helps you tap into your audience’s genuine motivations so that the point of mutual benefit acts as the persuasive lever. I’ll help you discover that intersection between your audience’s needs and what you are able to offer. 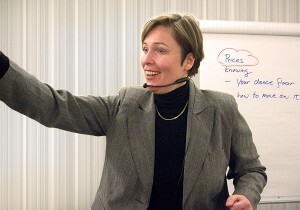 The QuickPitch method is useful in many areas of organisational or corporate life. Believe it or not, the same basic core QuickPitch skills will help you in many in many key areas. Remember, effective communication is as important within an organisation as externally. Because I know the processes and complexities of these situations, I have a clear understanding of how these organisational challenges need to be communicated. The QuickPitch method encourages leaders to embrace the substance of a situation and to communicate it in a digestible way rather than simply putting a glossy ‘spin’ on it. This is why it works so well in helping you achieve your communication goals. QuickPitch provides the project manager with the tools to make words count and turns communication into a project resource. Whether you’re buying or selling, you want to persuade the other party to give you the best price. The most important skill a trainer can master for a QuickPitch is how to carry the audience quickly to a place where the stage is set for them to be most receptive to the message. In a sense this is like preparing a fertile ground for the seeds of your ideas. I provide you with the skills to identify points of resistance and to address them while pitching in an audience-appropriate way, avoiding jargon and distilling your message to its essential points. You’ll learn useful techniques to help you visualise a successful conclusion. You will also learn to predict what can go wrong and how to avoid common pitfalls. I’m on a personal mission against time-wasting. Like you, I’ve been stuck in so many meetings which have achieved very little because of unnecessary friction, pointless diversions, personalities ‘showing off’ or grandstanding, unacknowledged lack of preparedness, lack of focus and failure to call a halt to drifting off-topic. Worse, too often people with something relevant and important to contribute are too intimidated to speak up, or the meeting simply runs out of time before they can be heard. Often people suffer in silence and don’t feel able to voice their frustration or boredom. This situation is not uncommon. But it is easily avoidable. We don’t have to put ourselves and each other through this nightmare. Meetings need an energetic and creative atmosphere for the best decisions to be made and for problems to be solved. It is my mission to show you how to achieve this, saving the health and productivity not only of each individual but of the organisation as a whole. Healthy, vibrant and productive meetings make healthy, vibrant and productive companies. I offer training both to those who facilitate meetings, and, more generally, to staff to improve their skills in participating productive meetings and to make their individual contributions count. I am also able to offer my personal services as a facilitator for key meetings.